The aguachile at Coni’Seafood is the most exciting thing I’ve put in my mouth recently. I made an odd noise when I saw the presentation – something combination of a gasp and a “wow!” Basically a ceviche, it is fresh raw shrimp marinated in lemon juice, topped with a fruity/spicy jalapeño puré. I recently visited the wonderful Peruvian restaurant Mo-Chica downtown, where ceviche has been raised to an art-form, but for a blast of pure fresh flavor, nothing can beat this aguachile. A serving was a dozen shrimp (for a surprisingly good price), so I was completely satisfied before moving on to a wonderful main course. This entry was posted in Food! 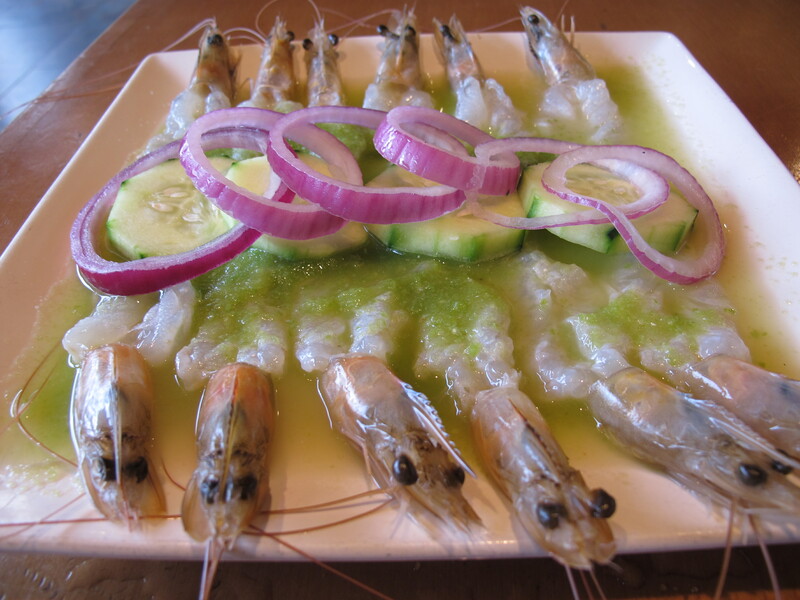 and tagged aguachile, ceviche, Coni'Seafood, food, Los Angeles Mexican Restaurants, Los Angeles Restaurants, Mariscos Los Angeles, Mexican Seafood, restaurants, Seafood by brucecritchley. Bookmark the permalink.